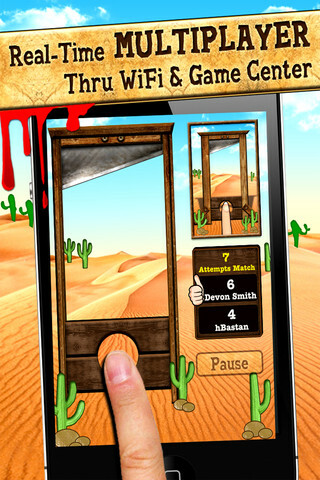 Finger Slayer is one of those REALLY simple games that take advantage of your smartphone's touch screen. It's basically a test for your reaction time, in the simplest form. 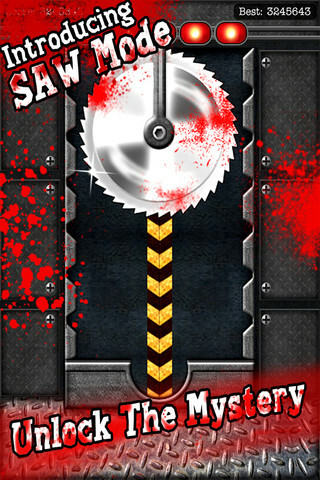 The goal in Finger Slayer is to not get your finger chopped off. 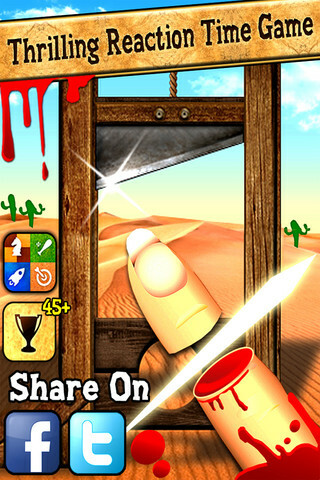 You place your finger at the bottom of a guillotine and need to pull it away the second the guillotine blade drops. If you managed to pull your finger away before the blade hit the bottom, you're safe. If not, you guessed it, your finger gets chopped off (and of course blood splatters everywhere, that's what happens when a rotating steel blade chops your finger off). The faster you pull your finger away the more points you get. But don't try to pull away before the blade drops or you'll be disqualified. Although technically you do have 10 fingers, you don't want to lose them all, so once you lose a finger the game is over. So the point is to get as a long a streak as you can, racking up the most points, till either you pull away to early or lose your finger because you pulled away too slow and the blade got you. The mechanics of the game are really simple but despite that they managed to create a pretty fun experience that gets even the most non-gamers to tense up when they place their finger under the blade.